1785 में कैवेंडिश आम हवा (यानी, वायुमंडलीय) की संरचना एक जांच से बाहर निकले, और प्रभावशाली सटीक परिणाम प्राप्त किया। उन्होंने हाइड्रोजन में प्रयोगों का आयोजन किया और साधारण हवा अनुपात में संयुक्त ज्ञात किया और फिर बिजली की एक चिंगारी के साथ विस्फोट किया। इसके अलावा, he also described an experiment in which he was able to remove, in modern terminology, both the oxygen and nitrogen gases from a sample of atmospheric air until only a small bubble of uncreated gas was left in the original sample. Using his observations, Cavendish observed that, when he had determined the amounts of phlogisticated air (nitrogen) and dephlogisticated air (oxygen), there remained a volume of gas amounting to 1/120 of the original volume of nitrogen. By careful measurements he was led to conclude that, "common air consists of one part of dephlogisticated air [oxygen], mixed with four of phlogisticated [nitrogen]". In the 1890s (around 100 years later) two British physicists, William Ramsay and Lord Rayleigh, realized that their newly discovered inert gas, argon, was responsible for Cavendish's problematic residue; he had not made an error. What he had done was perform rigorous quantitative experiments, using standardized instruments and methods, aimed at reproducible results; taken the mean of the result of several experiments; and identified and allowed for sources of error. The balance that he used, made by a craftsman named Harrison, was the first of the precision balances of the 18th century, and as accurate as Lavoisier's (which has been estimated to measure one part in 400,000). Cavendish worked with his instrument makers, generally improving existing instruments rather than inventing wholly new ones. Cavendish, as indicated above, used the language of the old phlogiston theory in chemistry. In 1787 he became one of the earliest outside France to convert to the new antiphlogistic theory of Lavoisier, though he remained skeptical about the nomenclature of the new theory. He also objected to Lavoisier's identification of heat as having a material or elementary basis. Working within the framework of Newtonian mechanism, Cavendish had tackled the problem of the nature of heat in the 1760s, explaining heat as the result of the motion of matter. In 1783 he published a paper on the temperature at which mercury freezes and in that paper made use of the idea of latent heat, although he did not use the term because he believed that it implied acceptance of a material theory of heat. He made his objections explicit in his 1784 paper on air. He went on to develop a general theory of heat, and the manuscript of that theory has been persuasively dated to the late 1780s. His theory was at once mathematical and mechanical; it contained the principle of the conservation of heat (later understood as an instance of conservation of energy) and even contained the concept (although not the label) of the mechanical equivalent of heat. Following his father's death, Henry bought another house in town and also a house in Clapham Common, to the south of London. The London house contained the bulk of his library, while he kept most of his instruments at Clapham Common, where he carried out most of his experiments. The most famous of those experiments, published in 1798, was to determine the density of the Earth and became known as the Cavendish experiment. 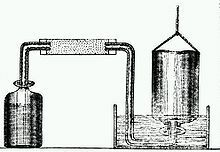 The apparatus Cavendish used for weighing the Earth was a modification of the torsion balance built by Englishman and geologist John Michell, who died before he could begin the experiment. The apparatus was sent in crates to Cavendish, who completed the experiment in 1797–1798 and published the results. The experimental apparatus consisted of a torsion balance with a pair of 2-inch 1.61-pound lead spheres suspended from the arm of a torsion balance and two much larger stationary lead balls (350 pounds). Cavendish intended to measure the force of gravitational attraction between the two. He noticed that Michell's apparatus would be sensitive to temperature differences and induced air currents so he made modifications by isolating the apparatus in a separate room with external controls and telescopes for making observations. Books often describe Cavendish's work as a measurement of either the gravitational constant (G) or the Earth's mass. Since these are related to the Earth's density by a trivial web of algebraic relations, none of these sources are wrong, but they do not match the exact word choice of Cavendish, and this mistake has been pointed out by several authors. Cavendish's stated goal was to measure the Earth's density, although his result obviously calculates G in order to do so. The first time that the constant got this name was in 1873, almost 100 years after the Cavendish experiment, but the constant was in use since the time of Newton. Cavendish's results obviously also give the Earth’s mass. Cavendish's electrical and chemical experiments, like those on heat, had begun while he lived with his father in a laboratory in their London house. Lord Charles Cavendish died in 1783, leaving almost all of his very substantial estate to Henry. Like his theory of heat, Cavendish's comprehensive theory of electricity was mathematical in form and was based on precise quantitative experiments. In 1771 he published an early version of his theory, based on an expansive electrical fluid that exerted pressure. He demonstrated that if the intensity of electric force was inversely proportional to distance, then the electric fluid in excess of that needed for electrical neutrality would lie on the outer surface of an electrified sphere; then he confirmed this experimentally. Cavendish continued to work on electricity after this initial paper, but he published no more on the subject. Cavendish wrote papers on electrical topics for the Royal Society but the bulk of his electrical experiments did not become known until they were collected and published by James Clerk Maxwell a century later, in 1879, long after other scientists had been credited with the same results. Cavendish’s electrical papers from the Philosophical Transactions of the Royal Society of London have been reprinted, together with most of his electrical manuscripts, in The Scientific Papers of the Honourable Henry Cavendish, F.R.S. (1921). According to the 1911 edition of Encyclopædia Britannica, among Cavendish's discoveries were the concept of electric potential (which he called the "degree of electrification"), an early unit of capacitance (that of a sphere one inch in diameter), the formula for the capacitance of a plate capacitor, the concept of the dielectric constant of a material, the relationship between electric potential and current (now called Ohm's Law) (1781), laws for the division of current in parallel circuits (now attributed to Charles Wheatstone), and the inverse square law of variation of electric force with distance, now called Coulomb's Law. कैवेंडिश की 1810 में मृत्यु हो गई (ब्रिटेन में सबसे धनी लोगों में से एक के रूप में) और उन्हें अब डर्बी कैथेड्रल है कि चर्च में उनके कई पूर्वजों के साथ दफनाया गया था। वह डर्बी में पर रहते थे सड़क को बाद में उनका नाम दिया गया है। The University of Cambridge's Cavendish Laboratory was endowed by one of Cavendish's later relatives, William Cavendish, 7th Duke of Devonshire (Chancellor of the University from 1861 to 1891). Cavendish was a shy man who was uncomfortable in society and avoided it when he could. He conversed little, always dressed in an old-fashioned suit, and developed no known deep personal attachments outside his family. Cavendish was taciturn and solitary and regarded by many as eccentric. He only communicated with his female servants by notes. By one account, Cavendish had a back staircase added to his house in order to avoid encountering his housekeeper because he was especially shy of women. The contemporary accounts of his personality have led some modern commentators, such as Oliver Sacks, to speculate that he had Asperger syndrome, though he may merely have been anthropophobic.His only social outlet was the Royal Society Club, whose members dined together before weekly meetings. Cavendish seldom missed these meetings, and was profoundly respected by his contemporaries. However his shyness made those who "sought his views... speak as if into vacancy. If their remarks were...worthy, they might receive a mumbled reply, but more often than not they would hear a peeved squeak (his voice appears to have been high-pitched) and turn to find an actual vacancy and the sight of Cavendish fleeing to find a more peaceful corner". Cavendish's religious views were also considered eccentric for his time. He was considered to be agnostic. As his biographer, George Wilson, comments, "As to Cavendish's religion, he was nothing at all". He also enjoyed collecting fine furniture exemplified by his purchase of a set of "ten inlaid satinwood chairs with matching cabriole legged sofa". Because of his asocial and secretive behaviour, Cavendish often avoided publishing his work, and much of his findings were not even told to his fellow scientists. In the late nineteenth century, long after his death, James Clerk Maxwell looked through Cavendish's papers and found things for which others had been given credit. Examples of what was included in Cavendish's discoveries or anticipations were Richter's law of reciprocal proportions, Ohm's law, Dalton's law of partial pressures, principles of electrical conductivity (including Coulomb's law), and Charles's law of gases. A manuscript "Heat", tentatively dated between 1783 and 1790, describes a "mechanical theory of heat". Hitherto unknown, the manuscript was analyzed in the early 21st century. Historian of science Russell McCormmach proposed that "Heat" is the only 18th century work prefiguring thermodynamics. Theoretical physicist Dietrich Belitz concluded that in this work Cavendish "got the nature of heat essentially right." As Cavendish performed his famous density of the Earth experiment in an outbuilding in the garden of his Clapham Common estate, his neighbours would point out the building and tell their children that it was where the world was weighed. In honor of Henry Cavendish's achievements and due to an endowment granted by Henry's relative William Cavendish, 7th Duke of Devonshire, the University of Cambridge’s physics laboratory was named the Cavendish Laboratory by James Clerk Maxwell, the first Cavendish Professor of Physics and an admirer of Cavendish's work. ↑ अ आ Cavendish, Henry (1766). ↑ Silberman, Steve, NeuroTribes: The Legacy of Autism and the Future of Neurodiversity, pp. 38-39, Allen & Unwin, 2015 ISBN 176011362X. ↑ Wilson, George (1851). "1". ↑ David Philip Miller (2004). ↑ See page 382 of Cavendish, Henry (1784). ↑ A. Truman Schwartz, Chemistry: Imagination and Implication, p.96, Elsevier, 2012 ISBN 0323145116. ↑ See page 376 of Cavendish, Henry (1784). ↑ अ आ इ Bryson, B. (2003), "The Size of the Earth": A Short History of Nearly Everything, 59–62. ↑ Poynting, J. H. (1894), "The Mean Density of the Earth" London: Charles Griffin and Company, page 45. ↑ Cavendish, Henry, "Experiments to Determine the Density of the Earth", reprinted in A Source Book in Geology, K. F. Mather and S. L. Mason, editors, New York: McGraw-Hill (1939), pp. 103–107. ↑ Brush, Stephen G.; Holton, Gerald James (2001). ↑ Clotfelter, B. E. (1987). ↑ Cornu, A. and Baille, J. B. (1873), Mutual determination of the constant of attraction and the mean density of the earth, C. R. Acad. ↑ James Clerk Maxwell, ed., The Electrical Researches of the Honourable Henry Cavendish. ↑ अ आ McCormmach, R and Jungnickel, C (1996), Cavendish, American Philosophical Society, Philadelphia, ISBN 0-87169-220-1, pp. 242, 337. कैवेंडिश, क्रिस्टा Jungnickel और रसेल McCormmach, अमेरिकन सोसायटी दार्शनिक, 1996, ISBN 0-87169-220-1, 414 pp. कैवेंडिश: प्रायोगिक लाइफ, क्रिस्टा Jungnickel और रसेल McCormmach, Bucknell विश्वविद्यालय प्रेस, 1999, ISBN 0-8387-5445-7, 814 pp.